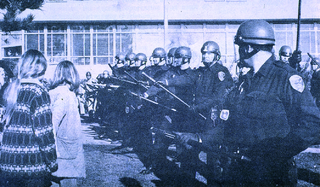 Newspaper photograph of police confronting students on the San Francisco State College campus during the 1968 strike. 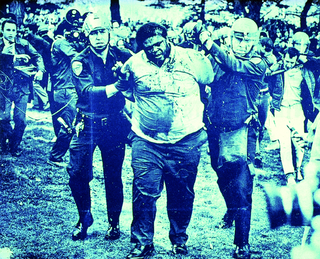 Newspaper photograph of two police officers arresting a man during the 1968 strike. 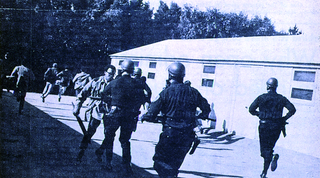 Close-up newspaper photograph of police officers arresting a man during the 1968 strike. 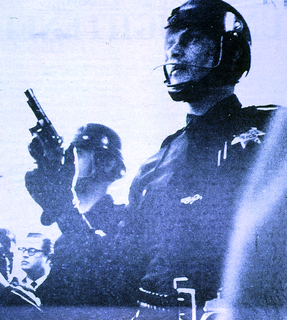 Newspaper photograph of a police officer holding a gun during the 1968 strike. 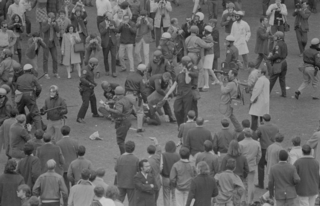 Newspaper photograph of police officers confronting a group of students on the San Francisco State College campus during the 1968 strike. 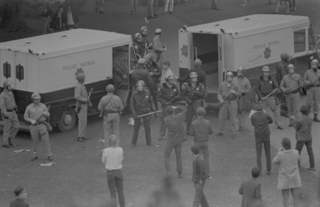 Newspaper photograph of police officers in riot gear on the San Francisco State College campus during the 1968 strike. 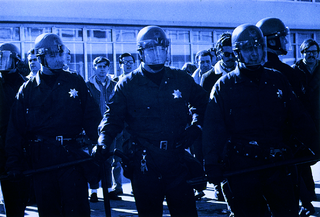 Newspaper photograph of police officers in riot gear on the San Francisco State College campus during the 1968 strike. 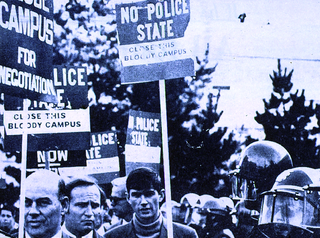 In front of the police officers is a protest sign with the words "NO POLICE STATE, CLOSE THIS BLOODY CAMPUS"
Newspaper photograh of police officers contronting protesters on the San Francisco State College campus during the 1968 strike. 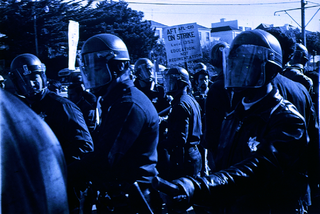 Newspaper photograph of a group of protesters marching with signs next to police officers in riot gear. 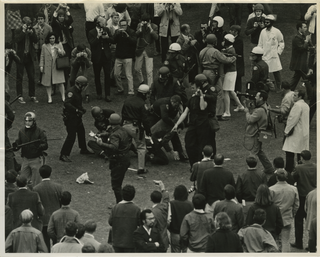 Newspaper photograph of police officers confronting protestors on the San Francisco State College campus during the 1968 strike. 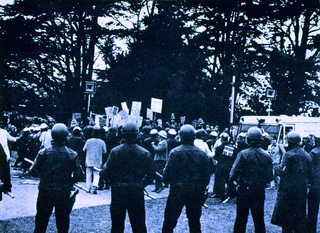 Newspaper photograph of protesters marching to San Francisco State College during the 1968 strike. 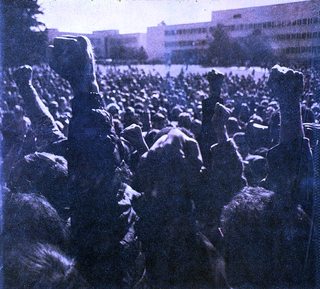 Newspaper photograph of students at a protest on the San Francisco State College campus. 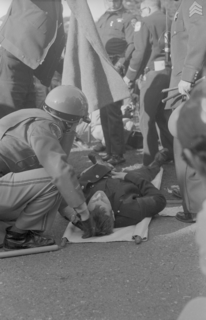 Photograph of members of San Francisco State Strike Medical Committee for Human Rights on hand during the 1968 SFSC student-led strike as police surround an African-American student striker knocked to the ground during a protest on December 3, 1968, known as "Bloody Tuesday." A crowd estimated at 2,000 students gathered on the Quad to listen to community activist alumni at the Speakers Platform that included Rev. 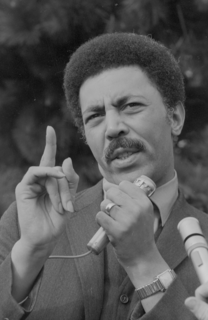 Cecil William (pastor at Glide Methodist Church), Willie L. Brown, Jr. (California State assemblyman), Ron Dellums (member of Berkeley School Board), as well as Carlton B. Goodlett (physician and publisher), who supported the strikers. Students wearing blue armbands from the Committee for Academic Environment scuffled with strikers who found themselves outflanked and retreated from barricaded areas, after the police dispersed, strikers reassembled at the Speakers Platform and threw rocks at the police, and violence escalated again. Photograph depicts Rev. 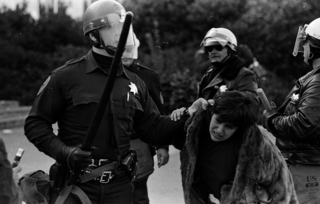 Gerry Pedersen being restrained at the neck by a police officer wielding a club on December 5, 1968. Pedersen has protested the police clubbing a student. Pedersen had been appealing to the police officer not to hit the student unnecessarily. In upper right corner police block nurse from getting closer to scuffle and Dr. Richard H. Fine (with mustache, beard, and dark glasses) with San Francisco State Strike Medical Committee for Human Rights wait to advance and provide aid. As violence escalated, community and religious leaders joined over 2,000 students in a community support day to encourage nonviolence. A march commenced from Ecumenical House with Rev. Jerry Pedersen, Dr. Carlton B. Goodlett, and others, who crossed 19th Avenue, entered the campus, and moved towards the Speakers Platform. Police confronted the crowd, ordering protestors to leave the campus Quad. Community leaders stated they would not leave until the police let them do so in peace. Community leaders and student were trying to comply when the police encircled them and a skirmish erupted. 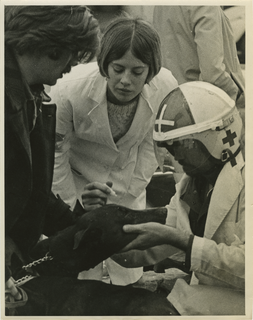 Photograph of members of San Francisco State Strike Medical Committee for Human Rights treat a dog that has been sprayed with mace on January 9, 1969. Photograph is documentation from the American Federation of Teachers (AFT Local 1352) who were marching on their own picket line, who had been served with an injunction, and when in the student protests police gathered agitated dogs in with student strikers and sprayed them with mace. 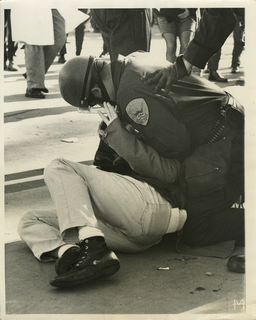 Photograph of San Francisco Police officer using a choke hold on student striker Bruce Hartford in a violent confrontation on January 14, 1969. 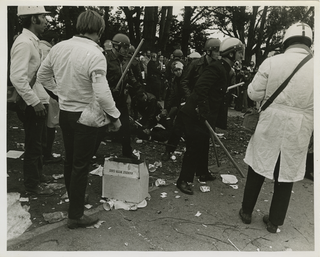 A member of San Francisco State Strike Medical Committee for Human Rights wearing a white lab coat approaches. 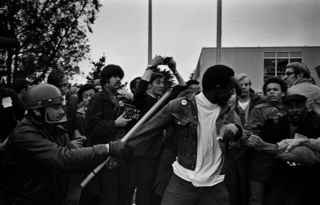 Photograph is documentation from the American Federation of Teachers (AFT Local 1352) who picketed at the main campus entrance at the corner of 19th and Holloway avenues when several scuffles started between students and police near the Science Building. 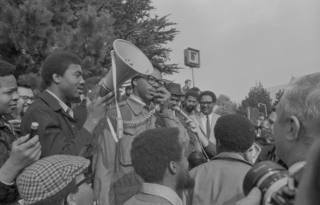 The Black Student Union invited four black community leaders including Dr. Carlton Goodlett, "Sun Reporter" newspaper editor; Rev Cecil Williams, pastor of Glide Memorial Church; Ron Dellums, Berkeley City Councilman; and Willie L. Brown, Jr. California State Assemblyman to a rally that became known as "Bloody Tuesday." This image was used as the cover image for the "San Francisco Express Times" 1: 46 (December 4, 1968): 1. 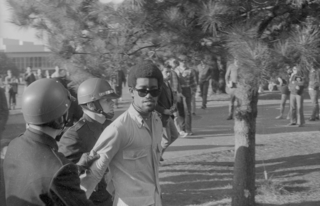 BSU member John Cleveland is arrested in a scuffle with police, Alex Soria can be seen behind bearded man with camera and Robert Prudhomme is third from the right. Man shields and leads young crying woman away from the violence on the San Francisco State College campus. Image used in "San Francisco Express Times" 1: 47 (December 11, 1968): 4. Tactical Squad officer holds down an unidentified protester with bloody face using club. 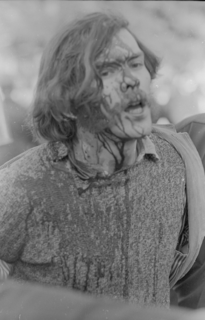 Image used in "San Francisco Express Times" 1: 47 (December 11, 1968): 4 and on the cover of Rolling Stone 30 (April 5, 1969) with the caption "American Revolution 1969." Police take unidentified bloody-faced blond student protestor away in handcuffs, the same day. The Tactical Squadâ€™s tactic for restraining protestors was to hold club tight across the throat. Officer down on "Bloody Tuesday"
San Francisco Police Department officer Paul Juul, aged 23, was knocked unconscious, struck in the neck with a brick (next to his foot). Officer down and out on "Bloody Tuesday"
San Francisco Police Department officer Paul Juul, aged 23, was knocked unconscious, struck in the neck with a brick, being covered by blanket in preparation for being transported to hospital. Hayakawa press conference after "Bloody Tuesday"
At the end of "Bloody Tuesday," S. I. Hayakawa holds press conference after violence on campus his first day as Acting President, wearing a flower lei, from "academic friends on campus," and surrounded by ten bouquets of flowers from "fans in Yuba City." Student reporter (left) wears Phi Gamma Kappa jacket. Image used as cover of San Francisco Express Times 1: 47 (December 11, 1968). 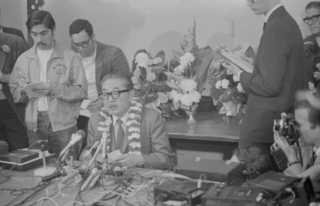 San Francisco State College Acting-President S. I. Hayakawa holding press conference after violent demonstrations, wears a lei of flowers "academic friends on campus," and surrounded with ten bouquets of flowers from "fans in Yuba City." A student reporter (left) wears Phi Gamma Kappa jacket. 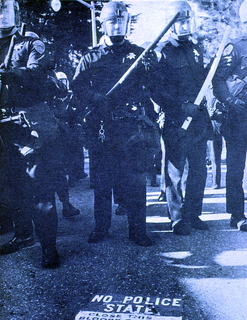 Image used as cover of San Francisco Express Times (December 11, 1968). The Tactical Squad marches onto campus as people watch from the rooftops and window. 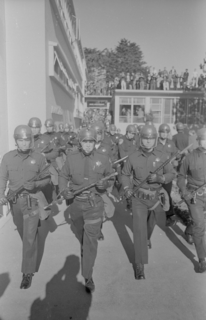 San Francisco Mayor Joseph Alioto (1916-1998) authorized the formation of a tactical squad in late-1967 to quell violence from student protests and youth disruption from the emerging drug culture in the Haight-Ashbury after the "Summer of Love." San Francisco Police Department vans parked and ready to receive people arrested during campus unrest at San Francisco State College. 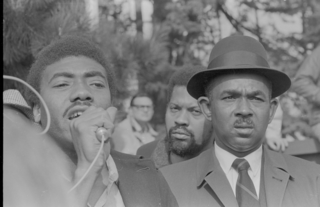 Photograph depicts Carlton Goodlett (right) with BSU members Bridges Randall (left with microphone) and Jack Alexis (behind Goodlett) as they address the crowd. 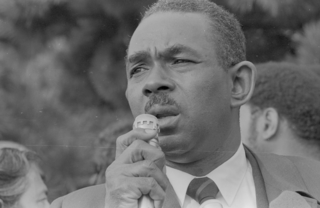 Dr. Carlton B. Goodlett, Vice President of the San Francisco Council of Churches â€“ was charged with unlawful assembly, failure to disburse, disturbing the peace, trespassing, and inciting to riot. Former SFSC History professor Dr. Juan Martinez, son of a migrant worker, experience the poverty of the Great Depression fought hard for his education; he attended college on the G.I. Bill, earning a Ph.D. in history at University of California, Berkeley by 1956. 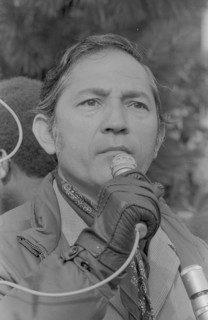 Martinez started at San Francisco State College in fall of 1966 and immediately clashed with History chair Ray Kelch over teaching course in Mexican-American history. At the end of the spring semester of 1967, Martinez was notified that his job would not be renewed for the next academic year. Martinez filed a grievance and President John Summerskill appointed him to be head of the College Commitment Program through the Social Science department. 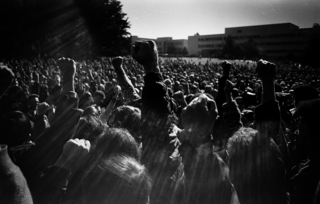 Confounded by institutional obstacles, Martinez proposed an alliance of ethnic student organizations that would work together around common goals of achieving educational equity at San Francisco State College. George Woo, a Chinatown community youth leader, wears a "Yellow Peril" pin addresses the crowd with Dr. Juan Martinez standing behind him. Woo went on to teach in Asian American Studies and serve as its chair. Dr. Carlton Goodlett speaks to the crowd as BSU member and Jack Alexis stand behind Goodlett. Dr. Juan Martinez of the College Commitment Program appears in the low left corner. 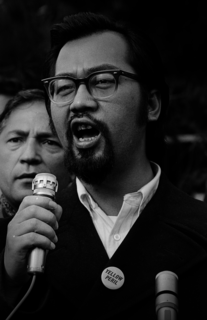 Unidentified community leader speaks to the crowd at San Francisco State College on December 5, 1968. BSU member Bridges Randall with bullhorn at Speakers Platform engages the crowd regarding the BSU and TWLF demands. 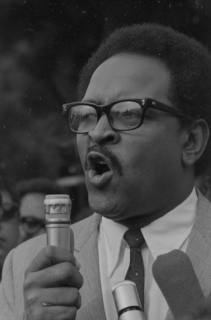 Dr. Carlton Goodlett (looking down) stands behind the bullhorn. Jack Alexis and Cecil Williams stand behind Goodlett. Berkeley City Council member Ron Dellums speaking to the crowd. 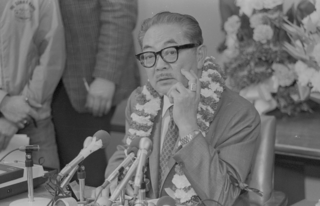 Later, Dellums asserted that Acting-president S. I. Hayakawa was a puppet. Image used as cover of "San Francisco Express Times" 1: 47 (December 11, 1968): 4. 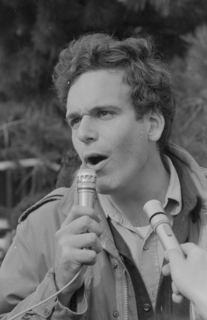 Twenty-year old Creative Writing student John Levin, a member of Progressive Labor and Students for a Democratic Society, encourages students to support the Strike at the Speakers Platform. 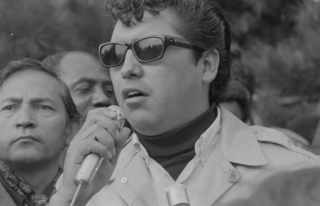 Unidentified TWLF member wearing Mexican-American Student Confederation, El Renacemiento (MASC) pin in lapel speaks as Dr. Juan Martinez stands by. Martinez was the faculty advisor for MASC, which was established in January of 1968. 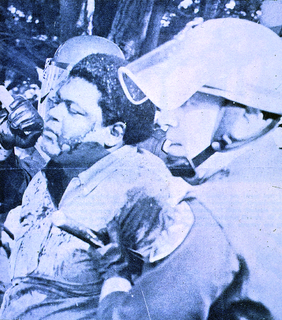 Image used as cover of "San Francisco Express Times" 1: 47 (December 11, 1968): 4. As Dr. Carlton Goodlett speaks to crowds from the Speakers Platform, black community leaders stand behind him with arms locked in sign of unity. 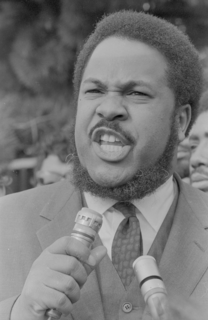 Pictured (left to right): Richard A. Bancroft, San Francisco attorney and member of the BART Board of Directors, Sylvester Brown, aged 29, a leader from Young Men for Action, a Hunterâ€™s Point youth group, who a week earlier led a cleanup effort in Hunters Point before a community festival, Cecil Williams, pastor at Glide Memorial Church, and Donald McCullum, Oakland attorney. Brown was charged with assaulting a police officer, failing to disburse, resisting arrest, and violation of Mulford Act. 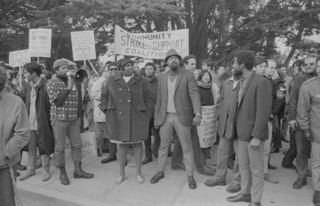 San Franciscoâ€™s first African American supervisor Terry A. Francois and a leader in the Urban League Thomas Gwynn also participated in the march. Students, community members, and protestors conclude their rally with a march around the campus. 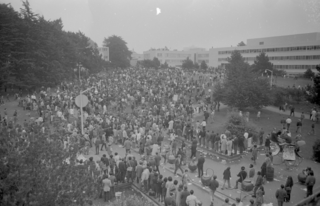 This photograph depicts the crowd moving across the campus Quad towards the Administration Building, the College Library to the upper right. Two days after "Bloody Tuesday," community and religious leaders joined over 2,000 students in a community support day to encourage nonviolence. The march commenced from Ecumenical House with Rev. 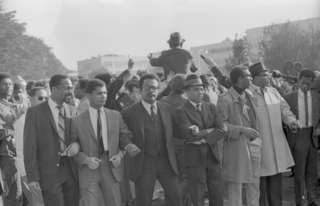 Jerry Pedersen, Dr. Carlton B. Goodlett, and others, who crossed 19th Avenue, entered the campus, and moved towards the Speakerâ€™s Platform. Photograph depicts Ecumenical House director Rev. 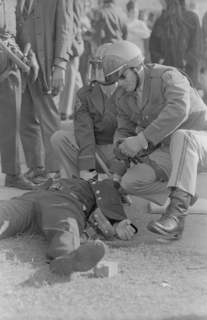 Gerry Pedersen being restrained at the neck by a police officer wielding a club on December 5, 1968. Pedersen has just protested the police clubbing a white student and officer is steering him to the left. A black bearded student just beyond has been knocked to the ground. Pedersen had been appealing to the police officer not to hit the student unnecessarily. In upper right corner police block nurse from getting closer to scuffle and Dr. Richard H. Fine (with mustache, beard, and dark glasses) with San Francisco State Strike Medical Committee for Human Rights wait to advance and provide aid. Police confronted the crowd, ordering protestors to leave the campus Quad. Community leaders stated they would not leave until the police let them do so in peace. Community leaders and student were trying to comply when the police encircled them and a skirmish erupted. Contributions to student legal defense were sent to Margaret Leahy care of Ecumenical House. In the violence, Drs. Richard Fine and Lawrence Rose with the Medical Committee for Human Rights were beaten despite being clearly identified. Rev. Jerry Pedersen, a campus chaplain and director of Ecumenical House â€“ was charged with failure to disburse, resisting arrest, and violation of Mulford Act. Three TWLF members, including Robert "Bob" G. Ilumin, speak to the crowd as Dr. Juan Martinez stands by. Among the students arrested, was Al Wong (a.k.a. Halford Lum), aged 24, a student organizer in the Intercollegiate Chinese for Social Action â€“ he was arrested on an existing warrant. Reverend Cecil Williams, pastor of Glide Memorial United Methodist Church, speaks in support of San Francisco State College student-led strike. 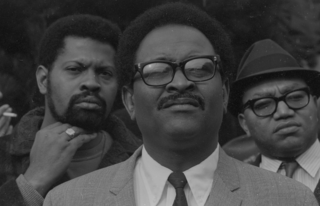 African-American community leader Cecil Williams with BSU members Jack Alexis (left) and Rip Ridley (right) listen to speeches from the Speakers Platform. 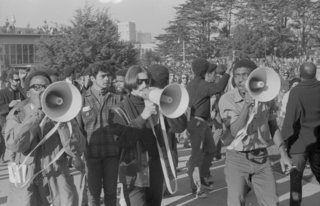 Administrator Dr. Elmer Cooper (left), Tony Miranda (center), and Bridges Randall (right) lead protest march carrying bullhorns. 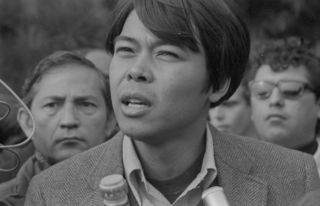 In February of 1968, Cooper (aged 28) was hired to be San Francisco State College activities counselor, and five months later was promoted to Associate Dean of Students specifically focused on student activities. Cooper was affiliated with the Bay Area Urban League. Miranda and Randall were leaders in the Third World Liberation Front. The following week, on December 11, 1968. Miranda and Randall (along with Jack Alexis) were chased down and arrested in front of AFT picket lines on existing warrants. 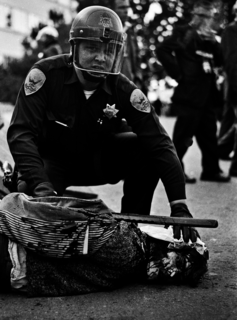 BSU member Claude Wilson arrested by two San Francisco Police Department officers. The Commons is in the background. Tactical Squad officer holding club drags young female by the collar during skirmish on the San Francisco State College campus. 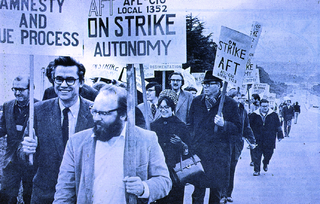 Photograph of various supporters of the student-led Strike at San Francisco State College with placards including, Community Strike Support Coalition, Pacific Heights ad hoc committee Supporting SF State Strike, SFSC AFT Local 1352, SJSC AFT Local 1362; Japanese-Americans Concerned â€“ Supporting Striking Students. 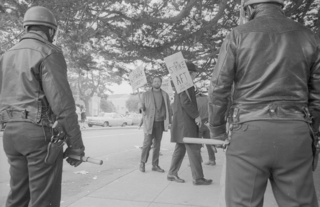 Police officer is positioned with club near picket line with placard reading (AFT Local 1928). 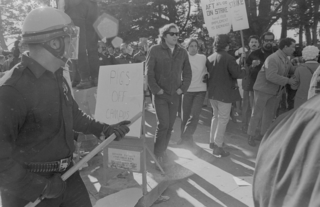 A poster reading "Pigs off campus" is on an easel provided by the Socialist Labor Party in San Francisco. SFSC AFT (Local 1352) picket along Holloway Avenue (Parkmerced is in the background) with signs reading "Education not regulation," and "Autonomy." 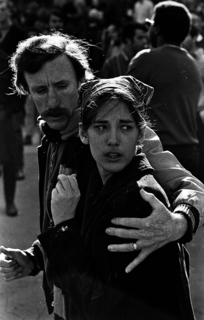 Gary Hawkins was the director of Forensics and chair of the Speech and Communications Studies as well as the president of San Francisco State chapter of the American Federation of Teachers (Local 1352) during the Strike. SFSC Faculty picket for "Education not regulation"
SFSU AFT (Local 1352) picket along Holloway Avenue (Parkmerced is in the background) with signs reading "Education not regulation," and "Autonomy." 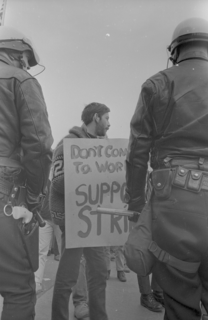 Gary Hawkins was the director of Forensics and chair of the Speech and Communications Studies as well as the president of San Francisco State chapter of the American Federation of Teachers (Local 1352) during the Strike. SFSC Speech professor pickets "Donâ€™t Come to work, support strike"
AFT representative Gary Hawkins in sweater carries placard that reads "Donâ€™t come to work, support strike" with two police officers blocking him. 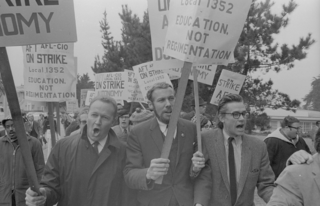 Gary Hawkins was the director of Forensics and chair of the Speech and Communications Studies as well as the president of San Francisco State chapter of the American Federation of Teachers (Local 1352) during the Strike. 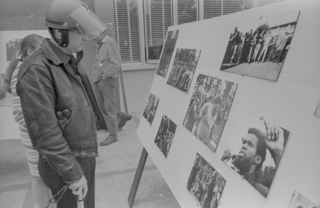 Tactical Squad officer looks at display of SFSC Strike photographs taken during protests during December 1968.